Shocked? What happened? Simple as that – there were not enough pilots to fly. As the studies exposed, an excellent workforce planning works perfectly for the both parties of a work agreement. (One can find there, an interesting “argument” on various meanings and factors of the workforce planning). So again, employers shall take into account their staff and to hear them, build a relationship! Employer branding equals the company branding (challenge me if you don’t agree) in a race called “Choose me, I’m the best”. Some of the companies constituting examples of encouragement for their employees rely on feelings towards clients, charity, nature of work itself. It’s ethical issue for me, and I don’t assume myself to judge it, but I think of purity of such intention. That would be a human kindness, willingness to help and pride of doing something useful. These are the factors, that would specify a company as the right one for the right people. 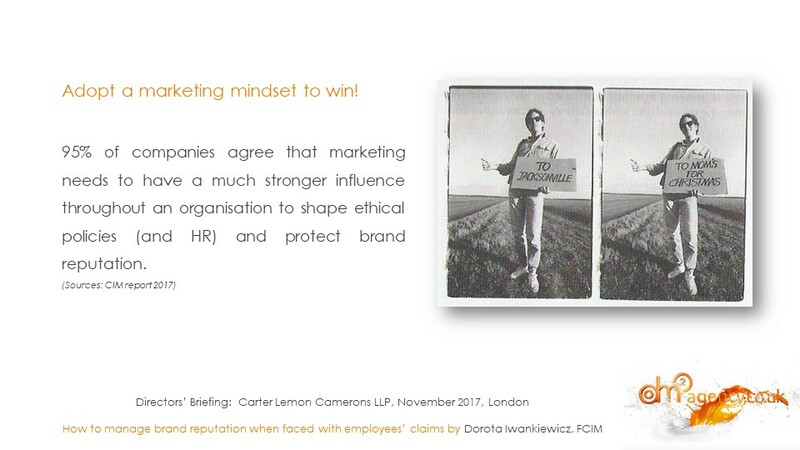 The subject was also presented on 16 November 2017 in London, at the Directors’ Briefing: Carter Lemon Camerons LLP: “How to manage brand reputation when faced with employees’ claims”. Dorota Iwankiewicz, FCIM, strategic and creative director DM2 Agency pointed out that employees = internal clients, and employers should meet their needs and base it on THE SAME language/ THE SAME value/ THE SAME goal. Staff requires to be informed, inspired, instructed, involved and incent. It’s also important to check with the job satisfaction factors, and keep on searching for new ones. We would recommend: recognise both and eliminate the right ones! Marketing builds up the brand, reputation and this includes employees who search for a well recognised employer. It’s highly recommended to become familiar with the subject, and marketers could help you to become THE ONE fantastic employer.